We’ve gone to great lengths to source materials that will look stunning, yet last a generation. 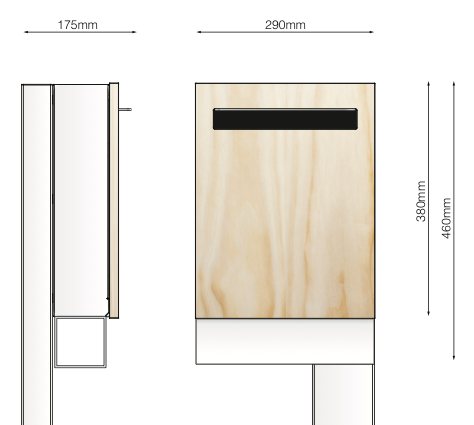 Javi - Mailbox designs feature a front panel precision machined from Accoya wood, a modified timber with properties that match or exceed the best tropical hardwoods and treated woods. Best of all it is manufactured from sustainable sources. This timber is a perfect solution for exterior products where aesthetics, less frequent maintenance, dimensional stability and durability are key factors. Our letterbox designs are precision fabricated and carefully coated to protect against corrosion. We insist on stainless steel hinges & fasteners to ensure that lifelong robust feel. As designers we pride ourselves on attention to detail. Prototype testing and design iteration during our development process means that the Javi - Letterboxes have a range of clever features that will surprise and delight. Whether it’s the stainless steel visor or the box within a box protective structure, the discreet lock access, the hidden fasteners or the handy magnetic door latch, we think you’ll appreciate the extra effort we’ve gone to. The Javi Letterbox comes in 3 models, Wall mount, Post mount and Fence Mount. We have created a dynamic font for you which can be CNC machined into your panel. Below is the number set of our font.